For the month of December, the Shhh Cooking Secretly group (initiated by Priya of Priya’s Versatile Recipes) is visiting the state of Bihar. Bihar is in the East of India bordering Nepal. The Ganges flows through this state roughly dividing it into two parts, the east and the west. The three main districts of Bihar are Mithila, Magadh and Bhojpur. Famous for Bhojpuri films, birth place of Goddess Sita (Mithila), Gautama Buddha attained enlightenment in the famous Bodh Gaya and the birth place of the Mahavir and Vasupujya Tirthankaras of Jainism. Bihari Cuisine is mainly divided into 3 – Bhojpuri, Maithil and Magahi Cuisine. Traditionally a predominantly vegetarian cuisine because of Hindu, Jainism and Buddhist influence. However, meat dishes are common in the Mithila region.Though present day cuisine is influenced by the neighboring states, Bihar is well known for its sattu. Its used to make cool drinks in summer, as a filling for litti chokha and parathas. Famous sweet dishes from Bihar are kheer, tilkut, lai( amaranth ladoos), Chandrakala, khaja, parwal ki mithai to name a few. My partner for this month is a new member to the group Seema, who blogs at Mildly Indian. Besides food recipes, her blog has an interesting travel diary and some droolable reviews. She initially gave me amaranth and jaggery to use as my ingredients. I wanted to make lai but I couldn’t get the amaranth to pop well and didn’t have time to wait for the popped ones to arrive from amazon. So I asked her replace one ingredient. So finally the ingredients to use were flattened rice or poha and jaggery. Am I glad I got those two ingredients as I prepared dahi chura for the first time. 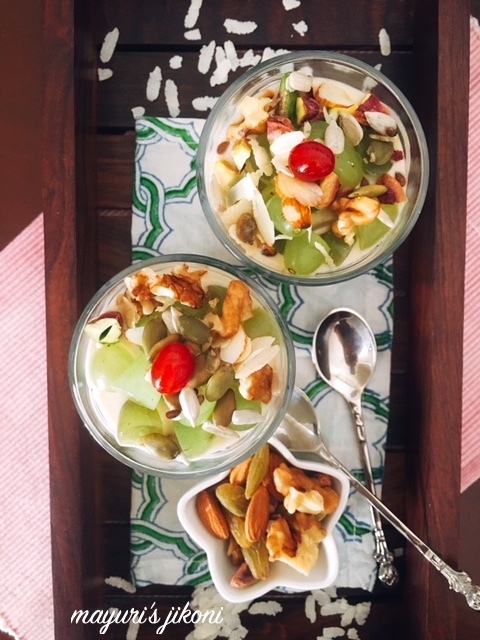 Dahi Chura is so easy to make and its such a delicious and yet healthy breakfast option or one can have it as a dessert too. Adding fruit, nuts and seeds makes it even more interesting and wholesome. I used palm date jaggery. In Bihar Chura is poha, flattened rice or rice flakes. This dish is usually prepared during Makar Sankranti and served as breakfast. I’m wondering how I missed such an easy and delectable dish! Dahi Chura is fast disappearing from the urban kitchens as it gets replaced by ready made cereals. However, it has many health benefits. Yogurt cools the digestive system and improves digestion. Helps to strengthen bones and immunity. Chura is easy to digest therefore ideal for old and young people. Chura keeps one full for a longer period of time and is gluten free. Here’s the recipe for this simple and healthy breakfast treat. I know I’ll be including this more often as a breakfast item. I gave Seema rice and mustard oil. She made some delicious looking Dal Pitha. Check out her recipe here. Put the chura in a sieve and wash it under running water. Leave the chura in the sieve and keep it on the side till required. Mix yogurt and jaggery together. Add jaggery according to your taste. Mix in the chura, fruit and seeds and serve chilled. You can use brown sugar or honey instead of jaggery. If the yogurt is too thick add 2-3 tsp of milk. I used the broad flat variety of chura but if you use a thicker one then you may need to soak it in 1-2 tbsp of milk before adding to the yogurt. It has to be soft. Wow, very simple but healthy breakfast option. Will try. I am also going to try this soon!Yummy! Love this quick and delicious recipe! I have heard of this dahi chura in someone's blog before but never could try the recipe. It looks very yummy. Parfaits are my fav ,we just can mix and match all our fav ingredients.. So delicious..
Have never heard of this recipe! Love learning a new recipe! Easy and Amazing! I have never tried Dahi Chura, but heard a lot from my friends, your recipes looks easy and delicious. Going to try it soon! I like the simplicity of this recipe and its so healthy too, almost resembles overnight oats. I have never heard of this recipe, sounds delicious and healthy. Love to try this recipe one day. Healthy parfait ideal for fasting days. I have never tried adding jaggery to it. looking very inviting and tempting. Jaggery in curd sounds strange though. never mixed two. I have made this for a mega BM and Absolutely loved it! A very simple dish loaded with nutrition! !one of the best regional breakfast ! !